A week or so go I spent a good few hours on Caroline Hirons' blog reading over some of my old favourite posts of hers and also some ones I'd never read before. It inspired me to give myself a little kick in the right direction with my skincare as my skin has been looking a little more worse for wear recently. I was inspired to reintroduce some of my old favourite products into my skincare routine and just basically pay more attention to it all round as I'd become a bit lazy about it, more lazy than I should be! My skin type is oily and blemish prone, but I do use some products in my routine that are also suitable for combination or dehydrated skin, so I'll be sure to mention what skin type I would recommend each product for so hopefully this will be helpful for people of all skin types, not just oily skin! In the mornings I do my skincare routine after I've had a shower. I know that some people do it while their in the shower, but I don't really like to because of all the soap and shampoo about which can break you out. I've also read that shower water can be too hot for your skin plus I'd rather not spend my time messing around with more products in the shower, I'd rather finish in there, get out, let my hair be drying if I've washed it while I use my skincare products. Cleanser- I start by cleansing with MyChelle's Fruit Enzyme Cleanser which is a product I absolutely adore. I originally got introduced to the brand as MyChelle contacted me to collaborate a while back and I'm honestly so glad they did because their products did wonders for my skin and I've repurchased this a number of times. I use a clean flannel every morning and massage this into my skin, then wash it off with water. This cleanser isn't specifically made for oily skin, it's meant to be for all skin types, but I still find it keeps me balance and helps with minimizing congestion in my pores well. Eye Cream- I then apply my eye cream and at the moment I'm using Jurlique's Herbal Recovery Eye Cream*. This is meant to be hydrating and anti-aging, so although I don't particularly notice any major difference to my eye area whilst using this apart from a little bit of help with puffy under eyes, I hope that it will slow the aging process in that area. I haven't really found an eye cream yet that I'm totally head over heels for but I am sticking with this one for the time being because it will hopefully help keep my skin youthful as I get older. Moisturizer- I then finish my morning skincare routine with moisturizer and I use another favourite from MyChelle. I absolutely adore their Pumpkin Renewal Cream and it's a moisturizer I didn't realize how much I loved until I tried something else in its place and all I wanted to do was just go back to using the MyChelle moisturizer. Again, this product isn't specifically for oily skin, it's for all/combination skin types, but I find it is just so perfect for my skin, it's nourishing whilst still lightweight and it has some amazing ingredients in there. Unlike my short and sweet morning routine, my evening routine is a little bit more detailed as this is when I use all my treatments which I feel really help my skin improve. First Cleanse- During the day your skin is exposed to pollution and general grime as well as having your makeup on which is why it's important to cleanse once to rid your skin of all this nastiness, then again to actually deep cleanse your pores. If you don't wear makeup for the whole day it's not necessary to do the first cleanse, but if my skin just feels congested anyways even if I've gone makeup free for the day, I will still do it. But, if I am wearing makeup even if it's just for a few hours I will always, always do a double cleanse because you it's so important to make sure your skin is properly clean at the end of each day. For my first cleanse I use Clinique's Take The Day Off Cleansing Balm which I find amazing for quickly removing all my makeup. I take a small amount on my fingers (you only really need a tiny amount) and then massage it onto my skin and eyes, then with a wet flannel rinse it off. Second Cleanse- Then onto my second cleanse I interchange too products, both of which I love; the MyChelle Fruit Enzyme Cleanser or T-Zone Sensitive Cleansing Cream Wash*. The reason I've ended up interchanging them is because I swear my skin gets used to a product after some time and then gets bad again. Both these cleansers work wonders for my skin but over time my blemishes have always returned so I switch them when it feels like my skin is 'getting used to them'. I have a full review of the MyChelle cleanser here and a full review of the T-Zone here so be sure to have a read of them. The T-Zone cleanser is specifically for oily, problem skin so if you have a similar skin type as me you might want to look into getting that. And it's only £1... you can't argue with that. Tone/Exfoliate- This is a step I've only recently started doing, you'll know if you saw my HUGE haul post at the beginning of the week I stocked up with some acid toners. What is acid toning all about? Okay, so I'm no expert, I've only recently just started using these but from what I understand, acid toning naturally exfoliates and resurfaces the skin which helps with acne scaring, discoloration and also keeps you skin smooth and soft. Like my second cleanse, I use these products interchangeably as so my skin doesn't 'get used' to either of these products. I'm currently using the REN AHA Resurfacing Concentrate which I find is working so well for quickly fading my acne scars and improving the texture of my skin overall. I apply this of an evening and wake up with soft, radiant skin and I use this for seven to ten days, then replace it with the Pixi Glow Tonic for seven to ten days. I also sometimes use the Pixi Glow Tonic in the morning as well before I apply my eye cream if I'm feeling extra oily and congested, but I tend not to use it in the morning with less than two days break from it (in the morning) as I don't want to completely overload my face with acid. Eye Cream- I then apply the same eye cream as I use in my morning routine, and that's again to keep my eye area hydrated and youthful! Moisturize- And lastly, I moisturize again using the MyChelle Pumpkin Renew Cream. One of the reasons I love this moisturizer is because it is great for both day and night use. It's not too heavy to apply during the day but it is still ultra nourishing. A few other moisturizers that I sometimes use of an evening which I'd recommend to people with drier skin is the Weleda Wild Rose Night Cream and the Balance Me Face Moisturiser. The Weleda Wild Rose Night Cream is one of my favourite other moisturizers ever as the effects it has on my skin are just amazing; I wake up with radiant, soft even skin. It's very inexpensive too so if the MyChelle moisturizer is a bit out of budget, I'd recommend the Weleda Night Cream instead. I loved the EH cleansing balm and never got round to trying Cliniques. I think I might have to give it a go when I run out of my current cleanser. 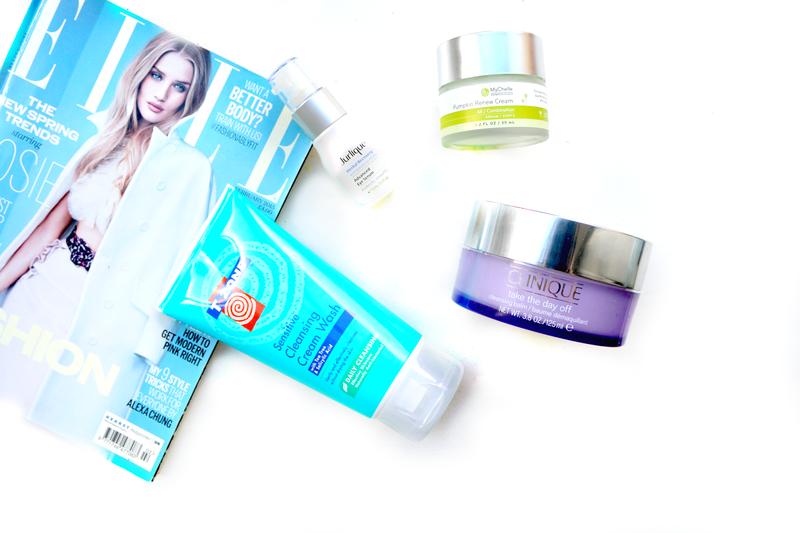 Great post and these products seem good for oily skin... I want to change up products though I love what I'm using right now!